We are Route 66 Dog Ranch LLC - Your happiness is our reward! 2.) Unaltered dogs are welcome to stay and board, however dogs over the age of 6 months old must be spayed/neutered to participate in daycare play groups. Females in heat are not allowed. 3.) Daycare dogs must be friendly with people and other dogs. If your pup needs socialization or help with shyness private training can be done during their stay. Will my dog have someone there at all times? Do I bring my own food or do they eat yours? What happens if my dog gets sick or hurt? While every precaution is taken to ensure a safe environment and injuries are rare, sometimes accidents happen. If your dog becomes injured or ill while staying with us, we will notify you right away and take your pet to your preferred vet. Yes, just like sending children off to school, there is always that possibility when being around new dogs. However every precaution is taken to ensure the cleanest environment, using cleaners that not only kill kennel cough, but almost all other doggy germs known to man. 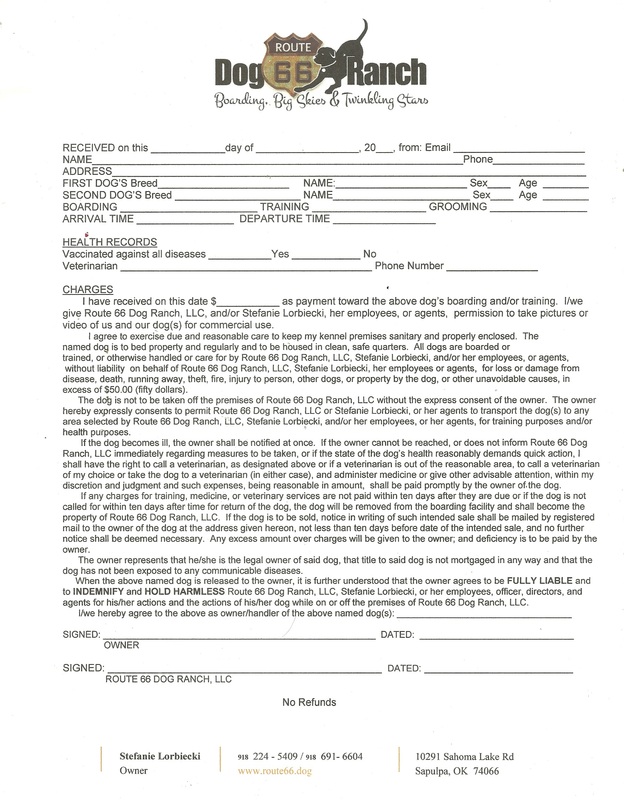 All dogs are required to be fully vaccinated before staying at the Dog Ranch and food and water bowls are cleaned each day. Is there a charge for extra playtime, potty breaks or medications? NO. What you see is what you pay. We believe that all dogs deserve extra playtime, treats, and attention and just because they may need a pill or two shouldn't mean extra costs for you. My pup has been a guest there on two occasions. He received excellent care in a pristinely clean environment. The owner and staff were great. I highly recommend the dog ranch! Riley will happily return if we are unable to take him with us. Route 66 Dog Ranch took our dog in on short notice when an emergency arose. I was a nervous wreck until we arrived and instantly I knew we had chose a compassionate, clean, and responsible caregiver for Biscuit. They went above and beyond my expectations. My 3 dogs seem to have had a great, long vacation there. One of them is actually a bit improved, his fear level of literally everything went from 10 to 7, that is great! Very nice, clean and spacious kennels and runs. Thanks for taking such great care of our pups! I will never take my dogs anywhere else. They took care of my 3 boxers for 6 days while we were on vacation. My babies had a blast, and I didn't worry a bit. Immaculately clean! Great running and playing space for the dogs. Huge indoor/outdoor kennels. And a price that can't be beat! I am so happy I have found a kennel for my fur babies that is CLEAN and has such an awesome, big play yard. This is where I will be bringing my dogs from now on!! Highly recommneded! Colt was well taken care of and happy. The dog ranch was a perfect retreat for our furry family member. Nicole is a sweetheart. Thank you for all that you do. Your dog will have fun at the ranch while you are away. Our mission is to give you peace of mind and your dog a fun, safe, supervised and clean place to stay. Since our company opened its doors in 2016, we’ve treated every customer like they were a part of our family. Other companies may offer similar services, but our services are the best, and come with a personal touch.